Booking a ski holiday during the early season becomes more and more worrying… That is after several season’s have shown that the snow seems to arrive later each year! Nevertheless it is very tempting to ski in the beginning of December. Due to fantastic offers, cheaper ski passes and most of all empty slopes! And if you are lucky you could have brilliant snow conditions too! To make it even more tempting the Three Valleys offer a ‘Ski guarantee’ to all clients purchasing a ski pass. The 3 Valleys guarantee you the largest number of open connected runs in Europe for the whole season*. Thanks to the nature of the domain and the numerous placement of snow canons the 3 Valleys area is able to guarantee snow cover on its ski area. This area is also maintained by 73 grooming machines each night. 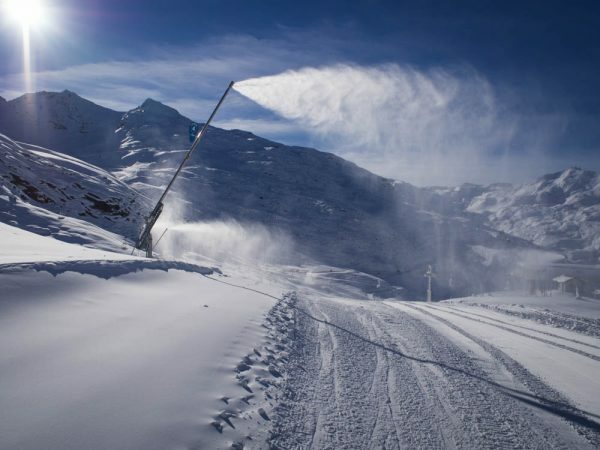 The 3 Valleys invested 2.5 million euros to ensure optimal snow cover this winter! The slopes will be equipped with more efficient snow machines to guarantee high quality snow and 100% fun. Interesting fact: There are 2189 snow canons covering 49% of the Three Valleys ski area. The 3 valley pistes are situated between 1100m and 3230m of altitude and 85% of the skiable area is above 1800m. The capacity of snowmaking as well as the high altitude and topography of the whole ski area and the connexions between the valleys (Always above 2000 m of altitude) guarantee snow throughout the winter. *To see application conditions, click here. The ski village of St Martin de Belleville connects right into the heart of the Three Valleys. This makes it one of the best resorts of this area! You can find our ski chalets either next to the main gondola with ski-in ski-out locations, in the village centre within short walking distance to the drag lift or in the surrounding villages such as ‘Chalet Ann‘ in Le Chatelard. If you don’t mind a short drive to the ski slopes you can book a luxury ski chalet situated in a beautiful French hamlet for half the price! During the early weeks of the season we have a fantastic ‘Early Snow Discount‘ offering a 15% discount on all December weeks. This discount applies to any of our ski chalets and chalet apartments in St Martin de Belleville! Find your perfect ski chalet now and book your ski holiday in one of Europe’s most snow-sure ski areas! To find out more about our chalets, click here.